A good composition is critical to any successful photograph. Every photographer, from the world’s top pros to a novice with a smart phone, must make compositional decisions when taking a photo. 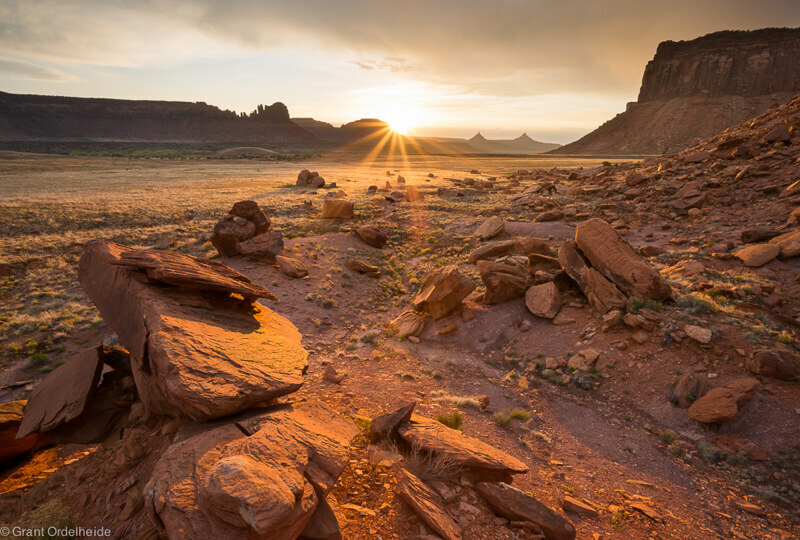 Here is a list of quick ways to help improve your compositions. Probably the single most important element of a photograph is the subject. A subject can take many forms, but ultimately it is what you want to show the viewer. A photo without a subject will lack interest and fail to convey anything of significance. While it may seem obvious to take a picture of “something”, I see many photographers taking photos without a clear subject. A person, place, or things are clear subjects, but a subject can also be more abstract like a mood or pattern. When taking a photograph, it is important to ask yourself what it is you are making this image of? If you can easily answer that question it is likely that you have a clear subject. 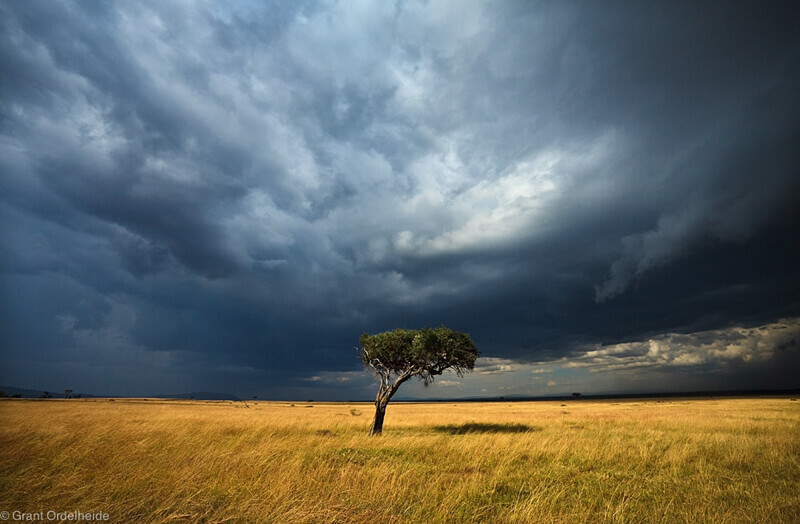 This acacia tree in this image becomes a clear subject due to its placement, the light, and the background. What drew me to this tree was the way that the dark storm clouds seemed to swirl above the scene. By placing the tree in the lower middle, I emphasize the tree while highlighting the impending storm above it. If you have ever taken a class on photography, you have likely heard of the rule of thirds. 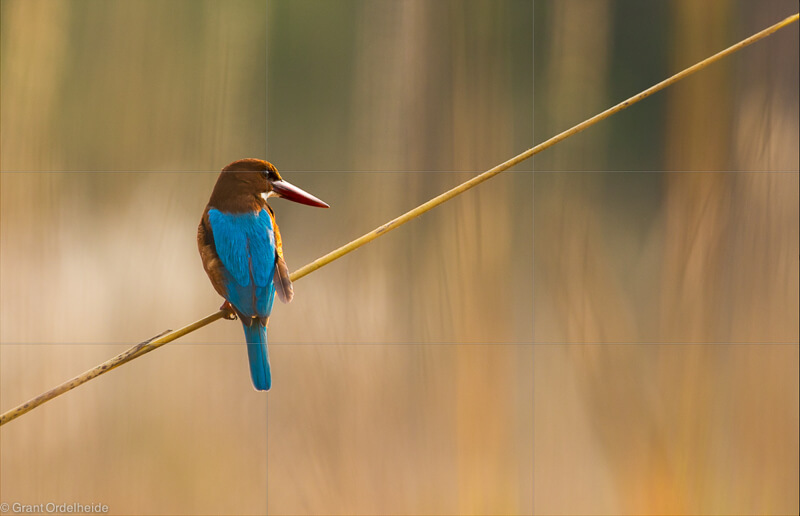 The rule of thirds is one of the quickest ways to get your photography on the right track. The method involves dividing the frame into thirds both vertically and horizontally. These lines provide a basis of where to place points of interest and other lines within the frame. For example, a horizon works well when it is placed in on the upper third or lower third of a frame. While it is a good idea not to get too rigidly attached to thirds, this rule is a great starting place for setting up a composition. The rule of thirds breaks down the frame into vertical and horizontal thirds. In this example you can see the grid and how I placed the focal point of the image, the birds eye, at the intersection of the lines. These intersections are a natural place for points of interest. Lines can be one of the most powerful compositional tools available to a photographer. Vertical and horizontal lines can give your image a feeling of repetition and help enhance a pattern. Lines that come from the bottom of the frame into the top, also referred to as leading lines, can help draw the viewer into the shot and point to your subject. Since lines give your images a geometric feel, remember to keep them as straight as possible. Vertical and horizontal lines that are slightly askew will distract from the composition and ultimately hurt the photograph. Lines are one of the best ways to draw your viewer in. 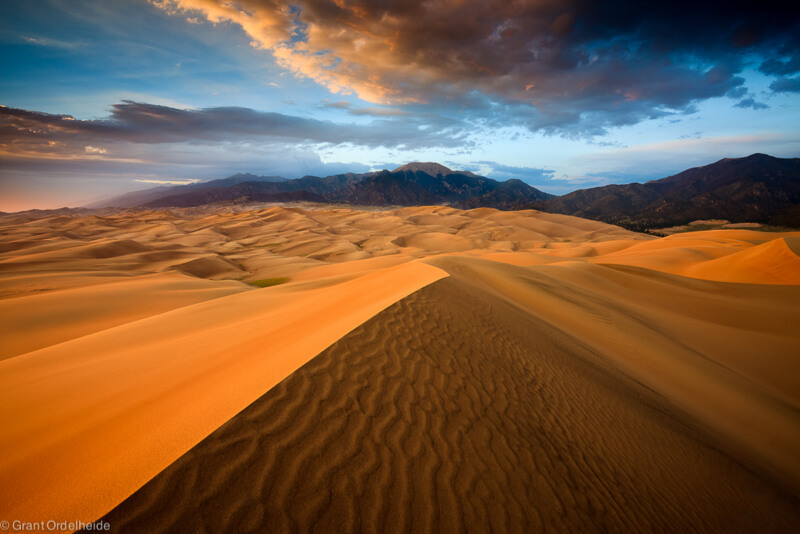 This sand dune image has many different lines that all lead to the peak in the background. Some are more obvious than others, but as you can see in the example with red lines, this image is carefully composed with diagonal lines to lead the viewer through the dunes and ultimately have their eye land on the mountains. Simplicity is an extremely valuable tool for creating striking photographs. 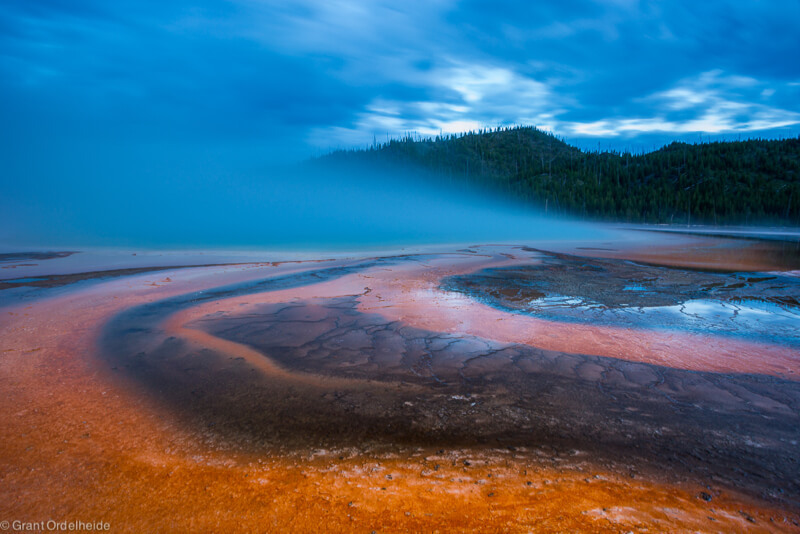 Consider how the elements of a photograph relate to each other. While it can be tempting to include everything in front of you, sometimes the more elements in a photo just mean more distractions. Everything included in your frame should be for a reason; if an element doesn’t add to the composition, it is taking away from it. Compositions that are clean and simple are often the most successful. 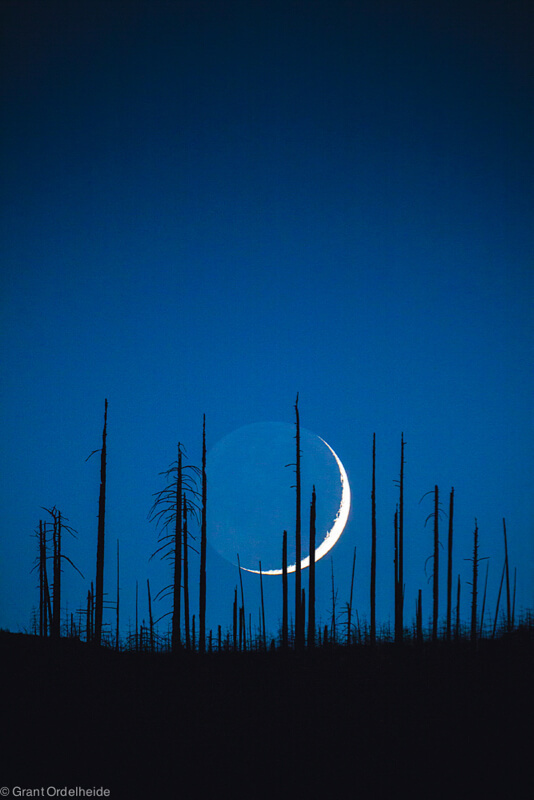 This image essentially only has two components, a crescent moon and a stand of silhouetted trees. The simplicity of the compositions and light let the features turn into graphic shapes. If this image had any more elements to it, such as a cloud or two, it would not be as graphically strong. One easy way to create added interest in your photos is to frame your subject with something. Framing can be very literal, where the viewer is clearly looking through one element at another. It can also be subtle, where compositional elements create a natural frame that highlights the subject. 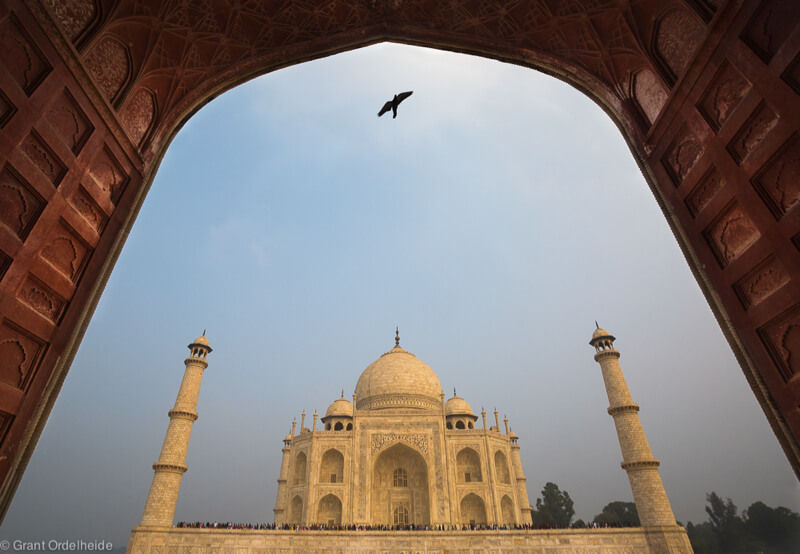 By using the doorway of an adjacent building to frame the iconic Taj Mahal, I was able to create a depth and added interest to an otherwise plain photo of this often photographed building. Scale is an important composition tool that helps to add context and drama to your images. 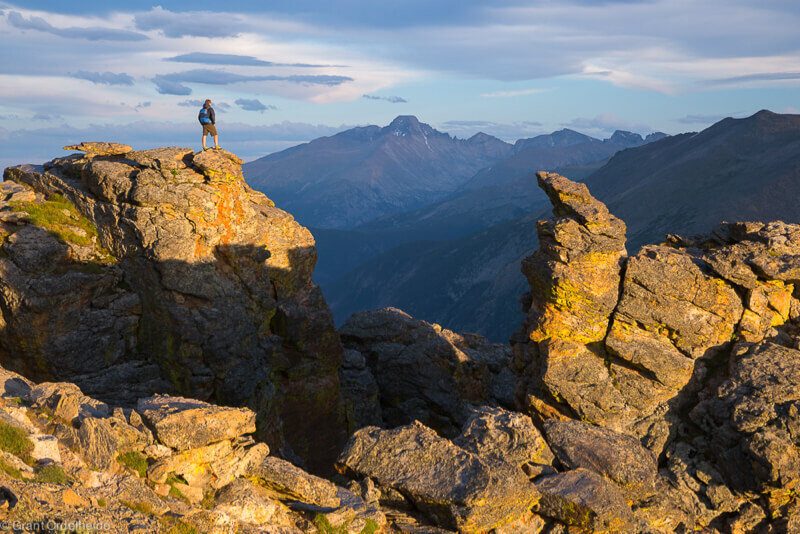 The easiest way to show scale (especially in the outdoors) is to add a human element to your photos. Showing items (human figure, tent, car, house) that are easily recognized will help to add scale to the rest of your image. When a human figure is added in front of a mountain, suddenly the viewer has a better idea of just how big that mountain is. Without the figure in the bottom right of this image, the photo would be lacking context and a sense of scale. 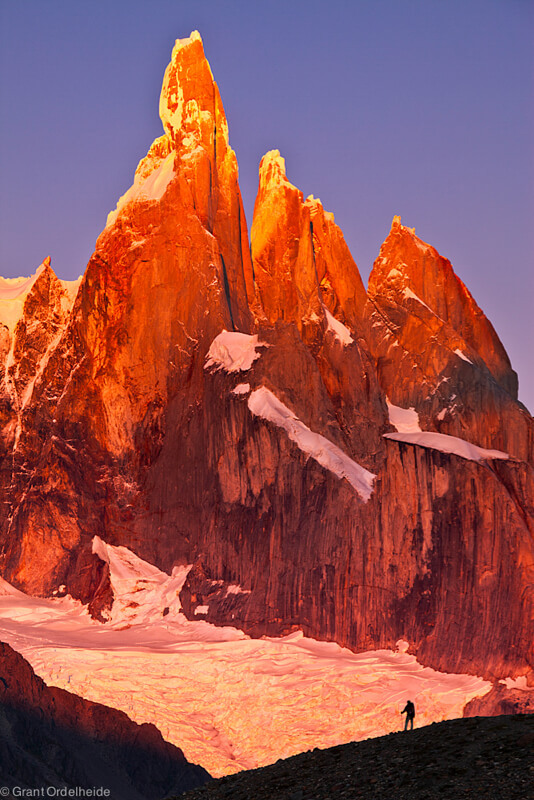 By adding a human element, the viewer gets a better idea of what it is like to stand in front of this mountain. 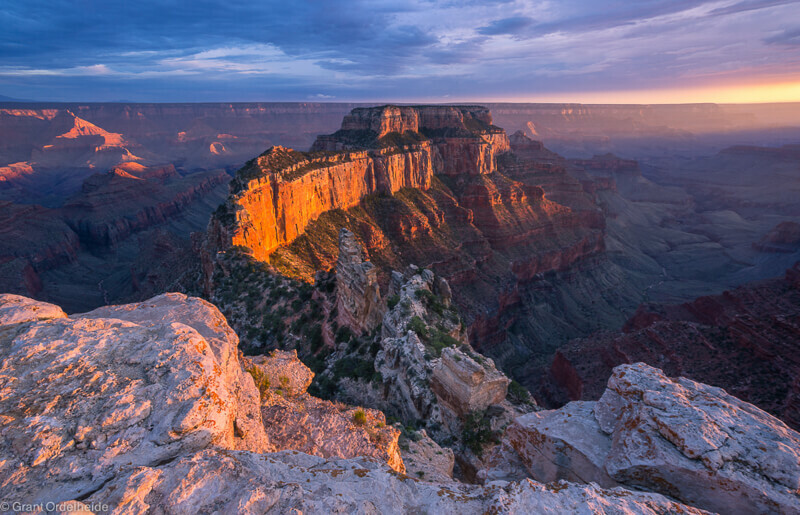 One of the best ways to achieve a striking composition is to utilize depth in your image. Depth is making a two-dimensional photograph appear three-dimensional and can be accomplished in a number of ways. A good place to start is to look for a scene with a good a strong foreground, a good background and a middle ground to tie them together. Using a wide-angle lens and getting close to the foreground will help to achieve a three-dimensional look to your photos. Depth can also be achieved by several other techniques previously mentioned such as leading lines and framing. In this photo, the foreground, middle ground, and background work together to help convey a three-dimensional feeling. In this case, the light raking across the foreground and background really helped to tie the two together. The corners of your frame can make or break your composition. Since a lot of the action begins from the bottom corners, it is important to pay attention to what is coming out of them. Using the corners as anchor points for leading lines creates strong and dynamic compositions. Corners can be active or passive depending on what you place in them. Be careful about letting dead space and distractions fill your corners and hurt your overall composition. The whole composition in this image really evolves out of the bottom right corner. By effectively placing lines from the corner, I was able to guide the viewer across the image. When you have a good composition, the eye should flow through it fluidly. You want the viewer to effortlessly navigate the composition from start to finish without having any “visual blocks”. Think about the scene as if you were to physically walk through it. You would take the path of least resistance and that is the same concept our eyes adhere to while viewing a photo. Make it easy for the viewer to navigate the photo and come to the subject quickly. Imagine you were standing where my camera was and you were to walk toward the sun. In this photo, I composed it so the eye would have to wander around and through the boulders to the background. The eye can easily flow through the bottom right, up the middle, and to the sun. Training your photographic eye is not an overnight process. Even to those who have a natural eye for composition, it takes years to refine their craft. Don’t get discouraged if you struggle with composition. Great compositions will utilize many of the points touched on above. Think about each idea individually and then find ways to combine them in the field. They say that it takes over ten years for your compositional eye to really develop. Like any craft, practice is key. Get out regularly with your camera and practice taking photos. Nothing will improve your compositions more than practice. Take these ideas and think about ways to incorporate them into a photo. Try out different compositions to help you visualize what works and what doesn’t.